I've always known how important it is to look after your teeth but I have rested on my laurels a little bit. I always thought the danger lurking round the corner for teeth was decay, and for that reason I never missed the twice daily brush up. I have no fillings at the ripe old age of 37 and I've always been proud of that fact. But, and this is a big but, my gums are receding. And I hate it. I know all the things you're meant to do to get healthy gums and to prevent and slow down gum recession but I have to admit to being really rubbish at putting all my knowledge into practise. I always blame lack of time. I know bleeding gums are a sign of a problem and regular flossing will help to reduce the bleeding; however I always feel too tired at bedtime to do it and nowadays in the morning, my focus is on the kids teeth, rather than my own. I would never forgive myself if I couldn't look after their teeth. I always remember my first ever visit to a dental hygienist over 15 years ago. She put the goggles on me and she attacked my mouth with such ferocity that there was a blood bath. I know she was doing it to show me the extent of my problems but what actually resulted was a real fear of using floss and I didn't revisit the hygienist for a few more years after that (I still kept up my dental check ups though). Although I have no fillings, I do have little cracks at the sides of my teeth where the gum has receded and they are now quite sensitive with cold food and if the tooth brush prods in certain places, it's not pleasant. I definitely believe that pregnancy accelerated my gum problems, apparently 1 in 2 women develop gum problems such as swollen and bleeding gums. I always try to instill in the kids the importance of brushing their teeth. They are still quite young to understand but I never forget being at primary school and being given a tooth brushing kit which included those red disclosing tablets. I loved using those, cleaning all the traces of the red dye from my teeth! When I was in my teenage years I was also the lucky owner of train track braces, which meant I had to be even more careful about cleaning them with all the bits of metal stuck all over them! To think that I have taken so much care of them but they may drop out because I've not properly got in the nooks and crannies really upsets me. So with that in mind I started to use Oral B Pro Expert, which has been clinically proven to prevent and reduce gum problems in 4 weeks. I'm using it in the hope the claim is true and it works to pull my teeth back from the brink! Writing this post has also reminded me that I need to get the whole family electric toothbrushes. The dentist recommended this a long time ago to me as it helps with the brushing action, stopping me from violently scrubbing them. I want to hang on to my own teeth for many more years, so it's about time I started following the advice from Oral B. * Quote above from Wiki Answers. 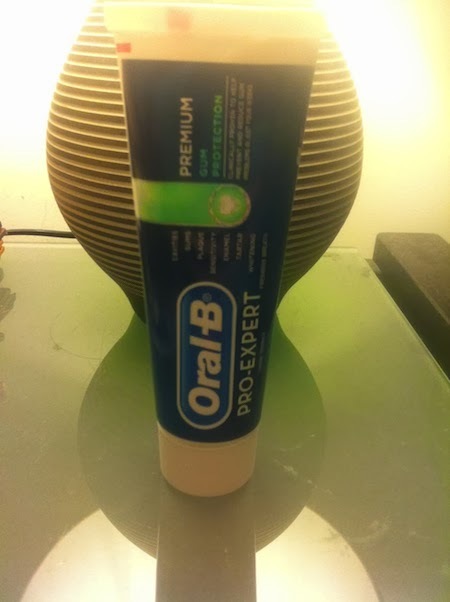 I was sent a tube of Oral B pro expert to try. Sounds like you are taking your children's dental health seriously which is great. Commenting for myself and on behalf of BritMums and thanking you for taking part.